Notes: Based on a four-panel parody manga by Fujishima Kousuke, a spinoff of his "Oh My Goddess" series. This collection of shorts features Urd, Skuld, Belldandy, and Gan-chan, the Morisato household rat, in a series of comedic misadventures (usually the fault of Urd and Skuld). 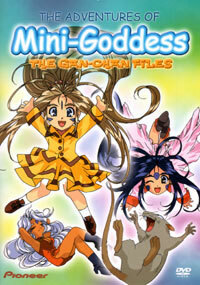 If you haven't seen Oh My Goddess, or really didn't care for it if you did watch it, don't bother watching this. Similarly, if your idea of humor does not include the "gag panel" style of comedy manga, where your favorite character is placed in various slapstick situations, then don't bother watching this. However, if you don't mind shutting your brain off for a little while and thinking, gee, what havoc could Urd and Skuld wreak on an unsuspecting rodent, then Adventures of the Mini-Goddess is for you. For a series of shorts, the animation is surprisingly good, almost up to the level of the original OAV series. Characterization and plot are totally unnecessary - if you're expecting that out of an SD feature, then you've already missed the point. (Super-deformed anime never makes sense in context to the original series. It's not supposed to.) And the music is appropriately silly, with a surprisingly beautiful end song (which I actually like better than a lot of the Goddess Family Club songs, much to my surprise). Again, if you don't like to suspend your sense of disbelief for an obviously silly parody series, then pass this up. However, if you do have a sense of humor that can forgive obvious stupidity in the face of cuteness ... well, then SD Oh My Goddess is just fine. Recommended Audience: Nothing really offensive. Just some slapstick violence (most of it visited upon the unfortunate Gan-chan). Children would find the action funny, and patient adults will enjoy the pop culture references. Of course, if slapstick isn't your cup of tea, then you shouldn't be watching this.